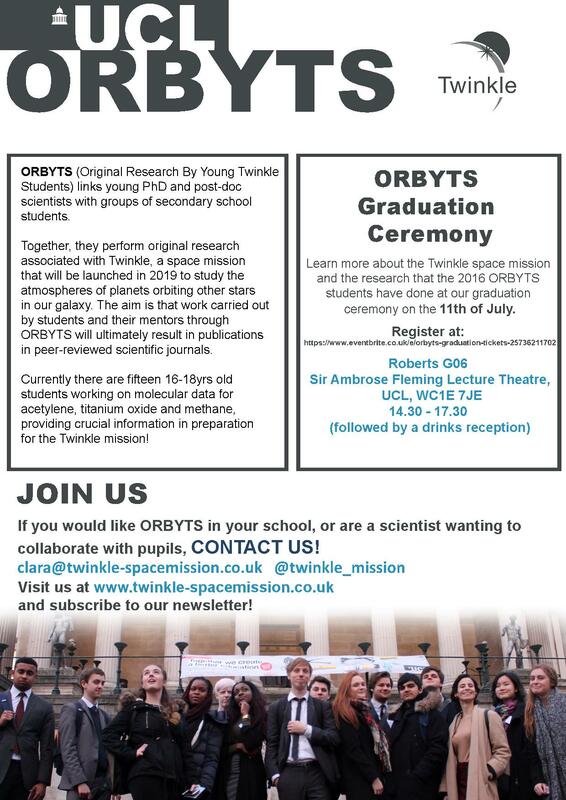 On the 11th July, there will be an official ORBYTS (Original Research By Young Twinkle Students) Closing Ceremony, where secondary school students will give presentations about their research in collaboration with UCL PhD students. Organised by Dr Clara Sousa-Silva (recent UCL PhD graduate, now part of the Researchers In Schools program), ORBYTS links UCL Physics & Astronomy PhD students and post-doc scientists with groups of secondary school students. Together they perform original research associated with Twinkle, a UCL-led space mission that will be launched in 2019 to study the atmospheres of other planets orbiting other stars in our galaxy. Three group leaders from UCL Physics & astronomy, Dr Laura McKemmish and PhD students Emma Barton and Katy Chubb each have a team of 4-6 Year 12 and 13 students from Highams Park School. These students are working with them to produce original research on the energy levels and spectroscopy of three different small molecules. Each of these small molecules is important in exoplanetary environments (such as working with hot Jupiters or eventually detecting life) which is crucial preparation for the Twinkle mission. The work the students are doing will be part of peer-reviewed journal publications in the near future. The ORBYTS project has a significant number of female participants and is an excellent example of encouraging women in STEM (Science, Technology, Engineering and Mathematics). This initiative is also a key component of the Twinkle Space Mission which has equal gender representation at the top level. The Closing Ceremony is free and open to all; guests are asked to sign up via EventBrite for numbers.